Liverpool FC today announced that they had reached agreement with Blackpool for the transfer of Charlie Adam. The midfielder had tweeted earlier that he was having a day off from pre-season training, watching Sky Sports News. The deal is subject to the player passing his medical and agreeing personal terms. The Reds first approached Blackpool for Adam in the January transfer window but the two clubs couldn’t agree a fee, Liverpool’s final offer of that window being a reported £6.5m. Over the course of the summer informal talks were held on a number of occasions but progress in reaching an agreement was extremely slow. Today’s announcement means Liverpool are on the verge of their second signing of the summer, following on from the purchase of Jordan Henderson. The statement from The Reds read: “Liverpool Football Club today announced they have reached agreement with Blackpool for the transfer of Charlie Adam. Blackpool also announced the news: “Blackpool Football Club can confirm that an agreement has been reached with Liverpool for the transfer of skipper Charlie Adam. No information has been released officially with regards the fee, although Blackpool had been holding out for £9m. The Blackpool Gazette reported that Blackpool “are expected to receive somewhere in the region of £7m, as well as two players.” The names of the players weren’t specified in the report. The latest developments in Liverpool’s attempts to buy Stewart Downing from Aston Villa were reported across the media overnight and this morning as the Reds were said to have had a £15m offer turned down for the former Middlesbrough player. Some reports say this was a follow-up to an earlier bid of £12m. The Midlands club signed Downing for £12m two years ago and insist his value has shot up since then, meaning they are now demanding £20m for his signature. With two years left on his contract there was an attempt by Villa to negotiate an improved deal but his agent (who also represents Jamie Carragher and Steven Gerrard) reportedly told them that Downing wanted to keep his options open. Arsenal have shown some interest in signing him but, with Downing understood to be set on a move to Anfield, Villa know they aren’t in a position to draw Liverpool into any auction. Liverpool are expected to make one further bid, perhaps for as much as £18m, but should Villa turn that down there would be a need for Downing to force the issue with his club by putting a transfer request in. Villa’s staff and players return for pre-season next week. Some reports also claim that Alex McLeish is interested in the possibility of using David Ngog as part of the deal, but the two clubs’ valuations on the young striker are some distance apart. Liverpool FC returned to pre-season training yesterday ahead of their flight to Asia on Sunday for their forthcoming pre-season tour and it’s safe to say that some of the faces at pre-season training will be less popular than others should they be part of the travelling party for the tour. It’s also safe to say that there will be huge disappointment at the absence of one face in particular. Liverpool’s club captain, Steven Gerrard, will remain back at Melwood as he continues his recovery from two groin operations at the tail end of last season. The medical staff at the club have decided it is in the club and player’s best interests that he continue his rehabilitation programme rather than risk travelling to China, Malaysia and Singapore with the rest of the squad. The anticipation in the region for the visit of the club is huge with supporters desperate to see the heroes that in many cases they will probably never get to see play at Anfield. That doesn’t stop them dreaming of making that trip and this tour gives them a little taste of what that would bring – and like any fixture there’s never a guarantee of which players will be fit and selected to play. 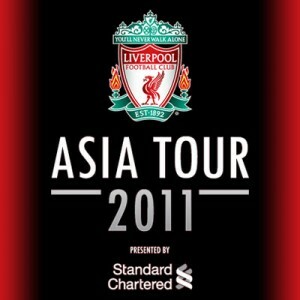 Other than that Liverpool intend to take a full squad out on the tour although it remains to be seen which of the players considered to be ‘deadwood’ will join them. For what seems to be the first summer in years there are no rumours of a major star looking to leave or be sold although there is still little visible movement in recruiting more stars to the ranks. Liverpool’s interest in the likes of Phil Jones, Connor Wickham and Gael Clichy came to nothing in the end with Jones preferring to move to Manchester United and Liverpool unwilling to match the bids made for Connor Wickham and Gael Clichy, with Clichy’s wages likely to be a further obstacle had it got that far. Liverpool’s next known targets are Charlie Adam and Stewart Downing, both players believed to be desperate to join the Reds but with both their clubs refusing to cave in for the amounts Liverpool have indicated they will pay. For now it remains a waiting game, all concerned waiting to see who will concede first in a stand-off that should ultimately favour Liverpool. In many ways just as important as bringing new talent in is the need to offload some of those players that are, to put it as kindly as possible, stuck out on the fringes of the first team. Some of the players that were almost certainly welcomed back through gritted teeth include Milan Jovanovic, Paul Konchesky, Christian Poulsen and Philip Degen. Alberto Aquilani has made the right noises should his return to Anfield turn out to continue after the closure of the transfer window following Kenny Dalglish comments to the same effect but it’s unlikely either would object to a move elsewhere should the terms be suitable. The one big signing of the summer so far is Jordan Henderson and although the midfielder was allowed a later start to pre-season than the bulk of the squad he is expected to take part in the Asian tour. Kevin Keen is the new First Team Coach at Liverpool FC after the club announced the latest change to the coaching staff following the recent departure of Assistant Manager Sammy Lee. Keen joins Liverpool from West Ham where he was previously the First Team Coach. The club say the 44 year old has signed a three-year contract and that he’ll be at Melwood tomorrow for the first day of pre-season training. Keen’s playing career began at Wycombe but he was best known for his time at West Ham, where he made 219 league appearances before moving to Wolves, Stoke and then Macclesfield. In all he played 502 league games before hanging up his boots in 2001. He has been a caretaker manager at West Ham three times and Macclesfield once. His first coaching role at West Ham came in 2002 when he was appointed as under-17 coach. He has worked as both reserve coach and first team coach on a number of occasions at West Ham, but his final role was as caretaker manager in West Ham’s final Premier League game in May. It is now expected that Steve Clarke will be named Assistant Manager, replacing Sammy Lee whose departure was leaked a few days before the official announcement came from the club. Although the official announcement said Lee had left the club “by mutual consent” it is thought he was asked to step aside in order that the club could make the appointment announced today. It is now expected that Steve Clarke will be given the title of Assistant Manager but a change of title will make little difference to the role he was already carrying out alongside Dalglish. Already a “King”, Liverpool manager Kenny Dalglish was given a new title today when the University of Ulster awarded him an honorary doctorate. 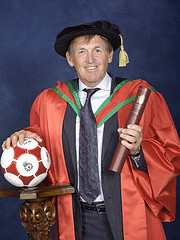 The award, the degree of Doctor of Science (DSc), was made in recognition of Kenny’s services to the game of football and also his charitable work. Liverpool supporters need no reminders of what he has achieved in his time in the game, a playing career that saw him make the move from Glasgow Celtic to Liverpool in the summer of 1977 and very quickly earn the Kop’s own honorary accolade of “King Kenny”. 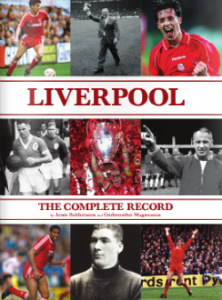 In his time at the two clubs he won every domestic honour available to a professional footballer in England and Scotland and also won three European Cups for Liverpool. As an international player he earned 102 caps for Scotland. He moved into the role of player manager in 1986, a role that brought him more success including the domestic double and Liverpool’s last league title, won in 1990. Accepting the award, Kenny – or Doctor Dalglish as he was referred to by the University – was as modest as always: “I feel very humbled to be the recipient of the award,” he said, “as all I was doing in my football life was something that I had dreamed of as a young boy. Users of Twitter will have no doubt started to notice a series of posters and designs mainly featuring Liverpool players and all in a new unique style. Dan Leydon, aka ‘blastedfrench’ on Twitter, has been producing his designs as a sideline to his day job but would like to make a career out of it. 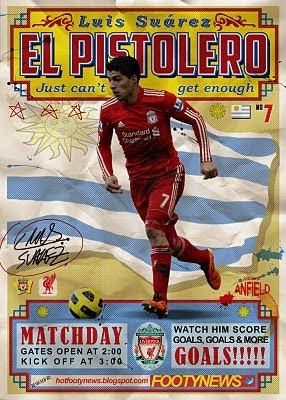 The talent is undoubtedly there but for now he’s at the stage where he is trying to get himself noticed, selling some prints and t-shirts of his designs through his ‘Footy News’ blog. There’s no doubting his passion for the game: “There’s something fantastic about how football draws together the strings of fitness, skill, reward and social interaction. A pub that holds a place in the histories of both of Merseyside’s Premier League clubs will tonight play host to a meeting on a topic that is close to the hearts of both of those clubs. The Football Supporters’ Federation are holding the event, ‘Safe Standing: An Open Meeting’, at The Sandon on Oakfield Road. Tonight’s meeting is on a topic that is hugely emotive for football supporters on Merseyside because it relates to the changes made to stadiums in the wake of the Hillsborough disaster in 1989. That disaster that saw 96 Liverpool supporters lose their lives and also saw the lives of countless others changed forever. To this day the survivors struggle to deal with the ordeal they went through and the families and survivors still await justice for the acts that caused their suffering. Supporters of both clubs lost people or saw friends or loved ones hurt that day. The Taylor Report was commissioned after the disaster and whilst blaming the disaster predominately on overcrowding, failures of the police and also on the layout of and methods of entry to the stadium at the time of the disaster it also recommended the introduction of all-seater stadia at clubs in the top two English divisions and the top Scottish division. The disaster happened at a time when the desire to curtail the hooliganism of a few had outweighed any desire to consider the comfort and safety of the majority. Hooliganism didn’t cause the Hillsborough disaster but had the attitudes of the authorities not been so focussed on curtailing hooliganism perhaps the safety concerns that had been raised time and again in the game in the years leading up to the disaster would have been dealt with first. Raheem Sterling scored the second goal for England as they won their opening Under 17 World Cup fixture with a 2-0 win over Rwanda at the weekend. The forward is one of six players from Liverpool in the England squad for the tournament in Mexico alongside Brad Smith, Adam Morgan, Jack Dunn, Matty Regan and Tyrell Belford. Liverpool paid QPR a reported £600k for the player in February 2010 in a deal said to be potentially worth £5m to the London club Sterling had grown up supporting. He turned 16 in December and in a memorable week in February bagged five of Liverpool’s goals in the 9-0 FA Youth Cup win over Southend before getting a place in the first team squad that travelled to Prague for the Europa League tie against Sparta. The full interview with Raheem Sterling is available at sportsvibe.co.uk: Eye on England – Raheem Sterling. Liverpool and Sunderland have both confirmed that a fee has been agreed for 20-year-old Jordan Henderson. Sunderland released a statement on their official website stating that he now had to discuss personal terms and would be travelling to Merseyside today “with the club’s blessing”. This was followed soon after by a statement on Liverpool’s official website reporting that Henderson would be on Merseyside today to “discuss personal terms and undergo a medical”. Neither statement mentioned David Ngog, the player believed to be moving from Anfield to the Stadium of Light as part of the agreed deal. Sunderland are understood to have accepted £13m plus Ngog in a deal which would value the French under-21 player at £7m.